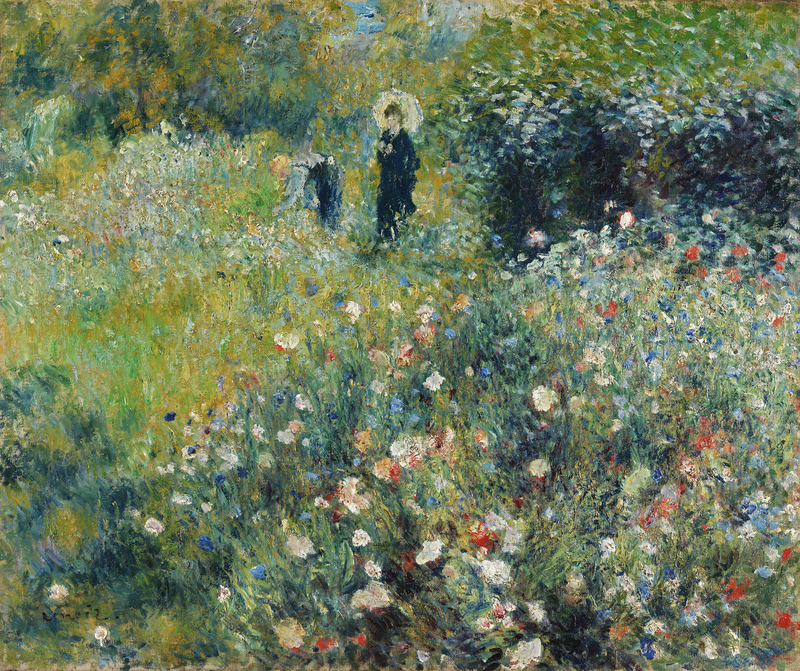 In Woman with a Parasol in a Garden, Renoir’s language is wholly impressionistic: in a setting lacking a visible horizon, the flowers and shrubs are created with tiny dabs of colour, providing a constant interweaving of textures around the two small figures. The woman, whose parasol shades her from the sun, stands close to the man as he leans down, perhaps to pick a flower, hinting at an intimate relationship. Contrary to what one may think, this canvas was not painted in the countryside but in the garden of Renoir’s new studio in Montmartre. His friend George Rivière recalled: ‘As soon as Renoir entered the house, he was charmed by the view of this garden, which looked like a beautiful abandoned park. It was unclear until only recently where and when Auguste Renoir had painted Woman with a Parasol in a Garden. Some authors hold that it was executed during summer 1873, when the painter was working with Monet at Giverny; others believe it was painted at the country house of his friend Charles Le Coeur in Fontenay-aux-Roses, in summer 1874, the year of the first Impressionist exhibition. Colin Bailey has recently stated convincingly that the picture was executed at the new studio surrounded by a large garden, which the painter rented in Montmartre in 1875 or 1876. 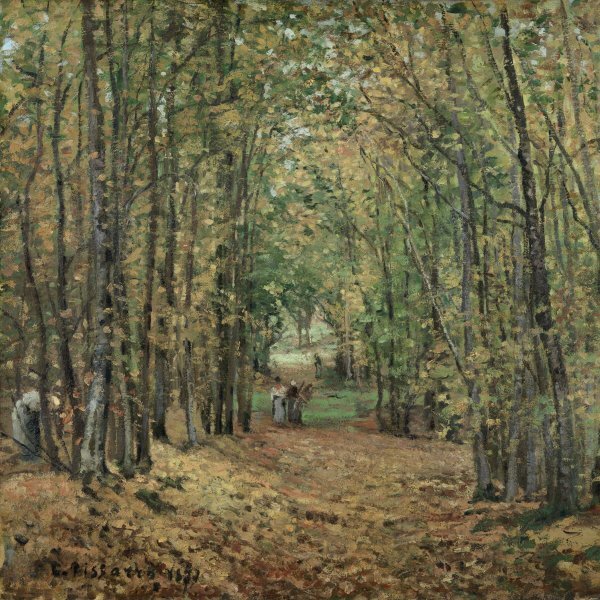 The doubt between these two years stems from the discrepancy in the testimonies of Ambroise Vollard, who dated the rental of the new studio on the rue Cortot to 1875, and the painter’s friend George Rivière, who mentioned it being the following year. Rivière recalled that “as soon as Renoir entered the house, he was charmed by the view of this garden, which looked like a beautiful abandoned park.” Colin Bailey has proved that the painting in the Museo Thyssen-Bornemisza featured in the inventory compiled by Paul Durand-Ruel on 25 August 1891 with the title Garden and the date 1875, and we therefore consider this year most likely. The same author mentions the possibility that the painting may have been shown with the title Garden and admired by critics at the Third Impressionist Exhibition of April 1877. 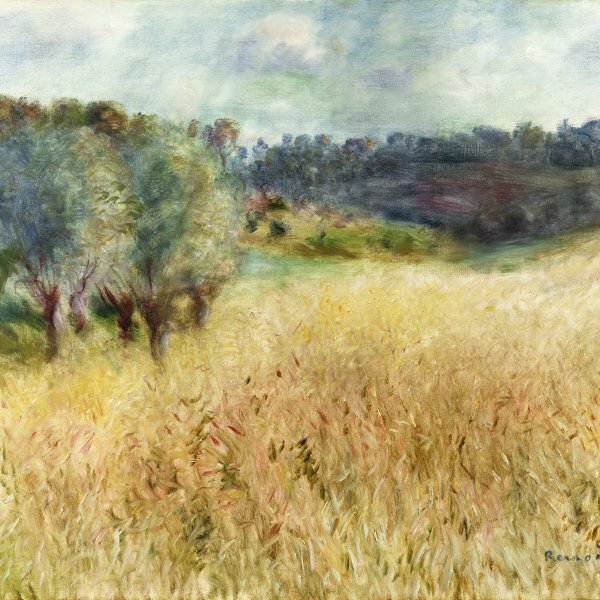 Renoir adopts a fully Impressionist language in this canvas and eschews the traditional structure in favour of a new arrangement of contrasting colours. In addition to the omission of the horizon, his handling of surfaces and manner of painting the garden flowers and shrubs create a constant interplay of textures that envelop the two small figures in the composition. As John House pointed out in his commentary on the painting, “every element in the scene is treated in a flexible and constantly varied touch, which evokes with great vividness the multiplicity of textures in this lavishly overgrown garden, but quite without focus on details.” In addition to the woman, who shields herself from the sun with a parasol, there is a male figure bending down, perhaps to pluck a flower. Their closeness suggests to House that there is some kind of relationship between them, as can be appreciated in Picking Flowers in the National Gallery of Art in Washington, a very similar work in which the man clearly offers the flower to the girl, although the gardener’s attire and straw hat worn by the man in the latter differ from the bourgeois costume of the man in the painting in the collection.